Let us now pass on to colour in movement, in rotation, according to the other nature of sight, the one that has been completely lost with the position imposed by the state of mind of Humanism. How could it have been otherwise, when the eye is reduced to being no more than an observer of objects and of spectacles external to itself? Those objects and spectacles being nothing more than appearances which have been frozen, deprived of all movement, because the eye itself has been frozen. Once the attention of the eye has been turned to the plane surface of the canvas given a certain tonality, its corporeal, static, spatial nature is now free to expand and it becomes, from that moment onward, an organiser, working in depth with a primary material that is, truly, plastic. The physical acts ['gestes'] that the eye is now going to accomplish are, then, those of its own movement. All along the paths that this movement will trace, life will be manifest. The coloured line will assume its full significance. I will not repeat what I have already said about movement. I refer you to the paragraph in which I showed it as it really is in its ultimate nature, which cannot be expressed, and also as it is when our own, human, activity is adapted to it for practical purposes, punctuating it with periods, cadences, of lesser or greater length, or of lesser or greater speed. We must not allow ourselves to be mistaken as to the origin of these periods. We must not imagine that they belong to the nature of movement-in-itself. They have no origin other than the process of our own adaptation to our own visual system. And this is so even when the physicist calls them 'waves' and attributes them to 'nature', when there can be no question of anything other than a subjective 'naturalism', of a trace left by something that, in itself, transcends this trace - a trace which has been imposed by the human 'nature' of the physicist himself, through the intervention of his eye, whether that eye is looking at the world about it, or at what is going on at the other end of a microscope. For everything comes back to this: without a pre-existent support there cannot be any extension or any movement. Space is the invisible, underlying canvas on which everything that, for us, occupies a fixed place, is spread. Movement is the invisible web that lies between the periods, full or empty, that we make out of everything that passes by, in time. The key to understanding how colours work in rotation is to be found in the chromatic circle, the rainbow. The chromatic circle understood as a successive series of modulations following one after the other and not, as I remarked when I spoke about Robert Delaunay, as nothing more than a useful guide for establishing the harmony. Yet again, it is Delacroix who was the first, in the nineteenth century, to restore the chromatic circle to honour among painters. After him, it became more and more common to turn to it for the purpose of orchestrating the colour - for the Nabis and for the Divisionists it became a sort of warhorse. But its use remained static, conformable to the idea of painting as an art of space, that fixed idea which was still imposed - even among the most daring painters, painters whose liberation was prevented by the subject - through the burdensome legacy of Humanism. 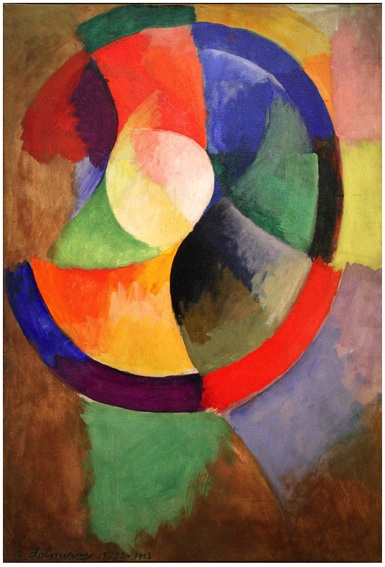 Captivated by colours, struck by the contrasts - simultaneous or successive - that colours establish among themselves, Delaunay, desperate to make his painting live, seized on the chromatic circle and was not afraid to use it in a pure state in compositions that are astounding, even if they are still, more or less, endowed by the classical, subjective mode of drawing with a figuration still bound to a precise location in space. Delaunay sought to make his colour 'turn', and it must be acknowledged that, often, he succeeded. To have made the chromatic circle pass from fixity to movement at a time when the rest of us, the Cubists, had not yet isolated the principles of translation and rotation in drawing - this was an achievement that impressed me deeply when, years later, I had very good reasons to see all the possibilities it opened up for the development of an objective painting, a painting no longer reliant for its self realisation on the heresies which rationalism had imposed with regard to the nature of the spectacle. What is more surprising in our time is that, apart from a small number of young painters who have gone to his wife Sonia to study the lesson of Robert Delaunay, most of those who cry loudest 'the subject to the scaffold' are quite content with offering a homage to Delaunay in retrospect. They seem quite incapable of understanding anything of what he has given them, a gift which they have to learn to use if, really, they want to know what must take the subject's place. It is true, as I have already said, that painting, in its object, is far from being known by these violent opponents of the subject who remain, in reality, its last supporters. The chromatic circle, made up of colours, is a function, not of light, not of the tonality that has been given to the canvas, but - like that light, that tonality, and those colours - of the eye. It is the eye that creates the chromatic modulation. This modulation does not exist as a reality outside the human eye. It is, certainly, perceived but, before what has been found in the outside world can come back to us, it has first to have been created within us. To study the chromatic circle as a thing in itself, as is done by the scientists, is a heresy, a pseudo-gnosis. It makes an abstraction of the cause. We must, certainly, insist on this error that turns Man away from himself, causing him to abstract himself out of what he himself has produced. The consequence of the reintegration of Man among the phenomena that surround him is the recognition that these so-called properties of the chromatic circle are, in reality, no more than properties of the eye. It is the eye that moves, not the colour. It is the eye which makes the contrasts, the eye which makes the melody, and these contrasts, and this melody, are nothing if one does not take account of the eye that is looking at them. We can go further. The chromatic circle which results from the natural mobility of the eye is the most perfect example of the order that regulates nature - universal nature, which is not quantitative, external, but, quite simply, the nature of Man, the subject realising its real, objective totality. The mobility of the eye is continuous, absolutely circular, or, more exactly in our case, spiralling. It is this mobility of principle which enables us to establish lines, relays, periods, infinitely variable in their divisions and durations. This periodicity in any particular journey has an orientation. It is of the order of a movement that has a direction and this directed movement is what is expressed in the chromatic circle. Our eye assures us, in the last analysis, that its nature, our nature, nature itself, loves exactitude and precision - that nature is flexible to this degree: that it is at once free and determined. This is its dual character, which may, at first, seem contradictory and which large numbers of intellectual observers have failed to understand. The chromatic circle enables us to understand it easily. Through it, the order of succession of the colours is determined. But the passage of one colour into another can be realised, faster or slower, according to the wishes of the person travelling. That is liberty in melody, modulation. There is, therefore, no opposition at all between order on the one hand and liberty on the other. How does the eye set about constituting the chromatic circle? In the simplest way imaginable. Let us see how the eye works according to the laws of its own nature. The time has come to make use of our sensibility. On the tonality of the plane surface of the canvas - the qualification we have given to the light of day - let us place a mixture of white and black, a grey, subtly harmonising with the value of the tonality. What happens to it? Once this mixture without colour is proposed to the eye, the eye immediately gives it a colour. Which? That which is furthest away from the tonality. If the tonality is a red, it is the tonality of a green that appears; if the tonality is a blue, it is an orange that intervenes ...The tonality is complemented by its opposite, as if each was creating the other in the circularity of the eye. The state of inertia of the plane, which had not been altered by the tonality, is altered now. It is a state of equilibrium, which only needs to be broken for movement to be introduced. The eye is adequate to the job. It turns between these two poles on its way towards light; and so it makes the most direct, the most regular melody; it establishes itself its range of tones. We know it, but we do not know it well enough to understand that this is no mere consequence of the reactions of different materials to light. It is a consequence of the action of the eye on materials variously situated in a world that is lit. The tonality and intensity of this world act on the eye and cause it to alter the colours, according to the relation that results between the light that is unqualified - white, for the practical purposes of the painter - and the light that is qualified by such and such a tonality and such and such an intensity. That is the painter's freedom of choice.